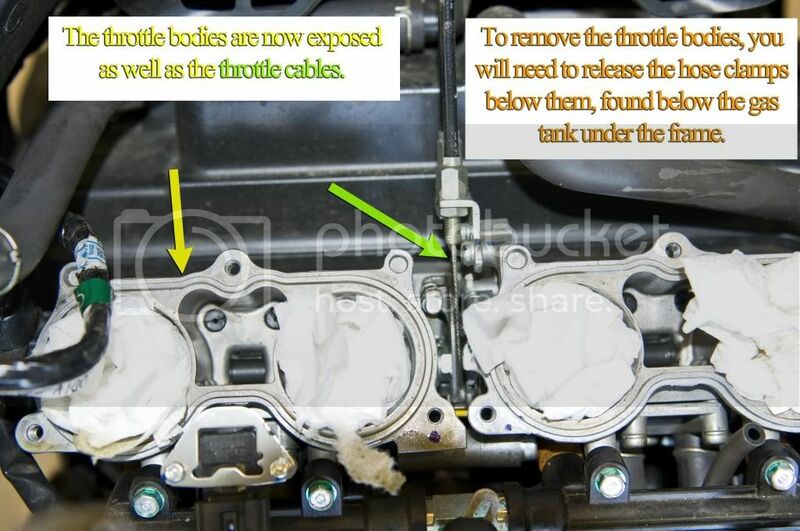 After a lot of searching and coming up with no results I've put together a step-by-step how to on removing your throttle bodies. I may have forgotten a small step on unplugging one item here or there, but you'll be able to figure it out. 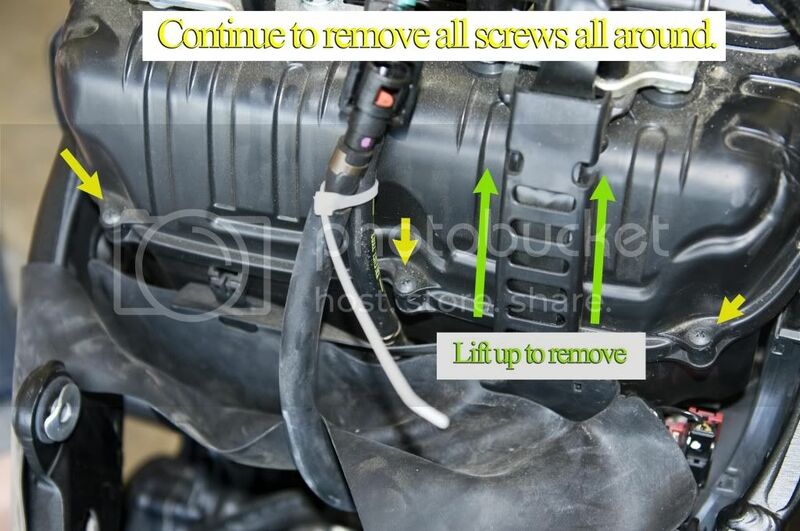 Note, people in CA may have an additional step to remove some 5-way joint hoses (not shown below). This will hopefully save you a headache and plenty of cursing. why exactly would someone want to remove the throttle bodies? 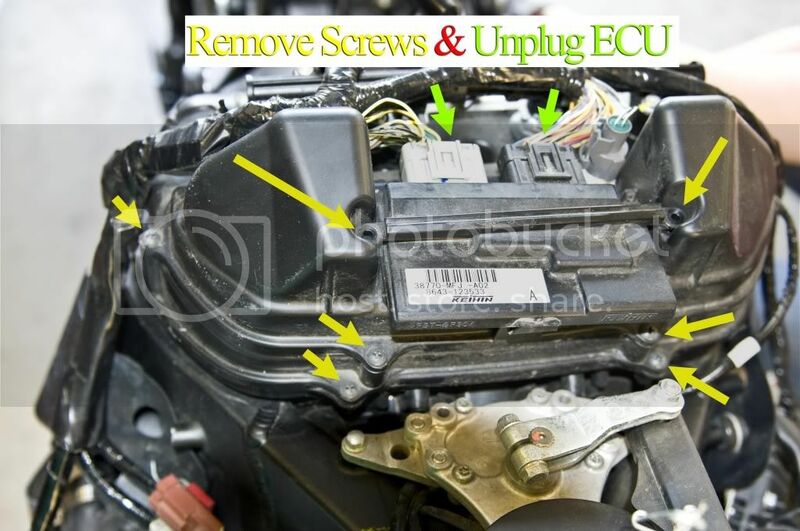 Engine rebuild, cleaning or throttle cable replacement. It's much easier to access the cables with it removed. Excellent explanation!! Just fitted a HRC quick action throttle kit to my RRA and got to the point of trying to work out how to remove the lower cable. Read your article and removed the throttle bodies and it is real easy. Stupidly refitted the stock cable and refitted the bodies but only took ten minutes to swap over. Overall lots of things to remove etc but pretty straight forward. Thanks man. I appreciate the feedback and always willing to help out the forum. The kill duration is 65ms do I need to increase the kill duration to say 70 ms? PM'd you to keep this Throttle body related. I need to change my throttle cables over the winter, while im at it ill be upgrading to the motion pro revolver throttle kit, so thank you for making this thread!!! You're welcome. I upgraded to the Motion Pro as well, so I figured I'd document the process since I didn't see one up here. The only tool you'll need is an extra long philips screwdriver (16") to get the throttle bodies loose. You can get it for cheap from Harbor Freight, since I doubt you'll use it again. Okay, so I am going to bump this thread as well and as why I am not seeing this screws that I need to loosen in order to get the bodies out on my '08. I have a throttle kit coming in and it seems that I will save some headache if I remove these to replace the kit? Nevermind. I see them. So if I loosen these that is all I have to do to remove? Anyone know if this really helps with the cable replacement that much? I am not even seeing how I will do it without removing the bodies. 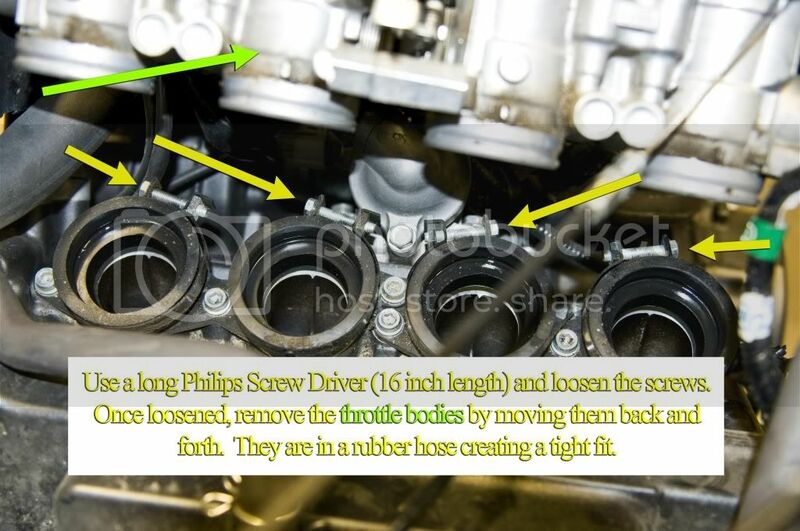 The screws that tighten the hose clamps to the throttle bodies are in the picture below. 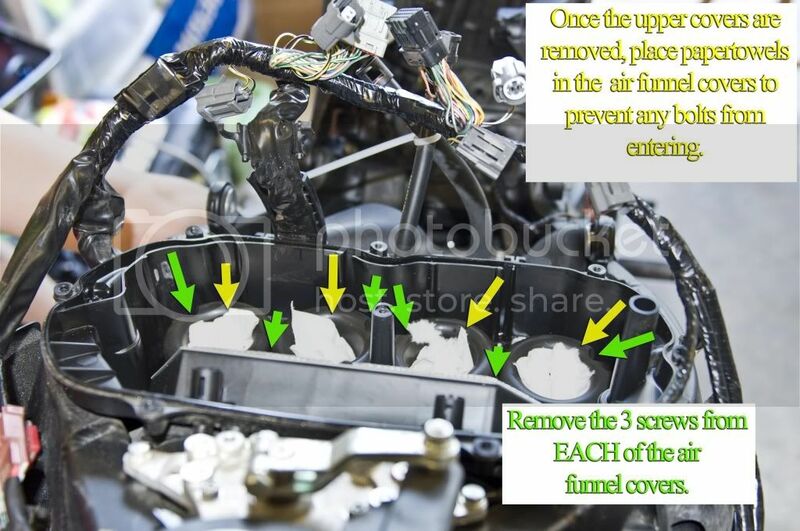 In order to access them, look underneath the frame, above the clutch cover and strator cover. On the strator side you'll see them by your VIN sticker on the frame. You can access the two on the left, then go to the other side for the two on the right. You should be able to see them with your fairings on. 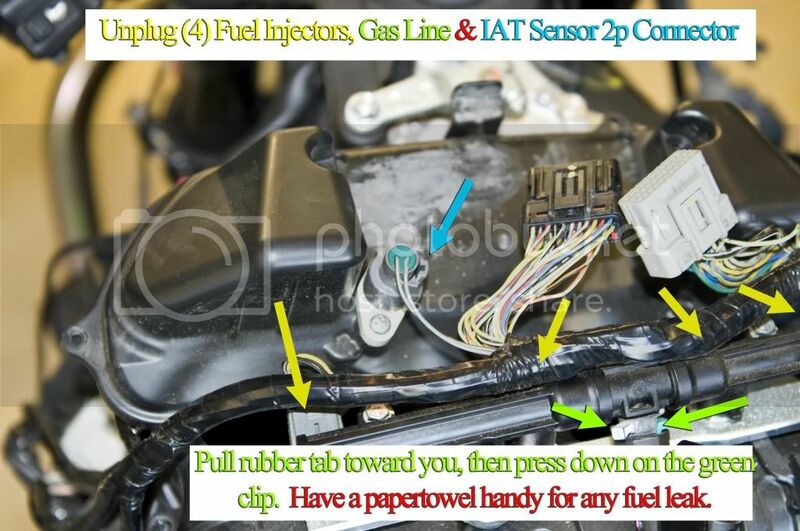 Yes, if you loosen, that's all you need to remove the OEM throttle cables. The only way to do it without removing the bodies, which is more of a PITA, is to use a pair of needle nose plyers that are curved, and you'd reach below the green arrow. My method is much easier, even though you have an added step. You just need a long philips screwdriver. Check harbor freight, and use a 20% coupon. Okay. As soon as I posted this I finally noticed the screws and understand how now. My other question is how tight do they need to be? I noticed two of them could be tightened more but I do not want to over tighten. I just read the service manual, no mention of how tight the insulator band screws (technical term) should be. I just made mine snug. 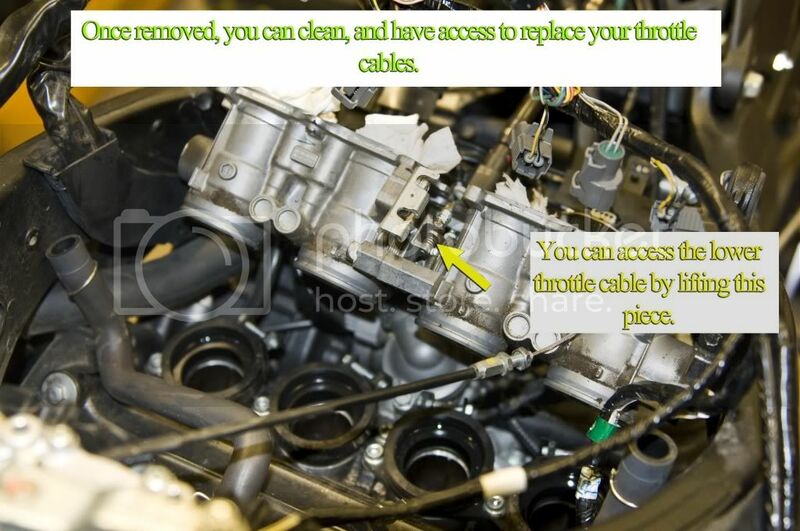 The Throttle Bodies are mentioned on page 6-60 of the service manual. Okay...I am looking. So after those bands are removed they should come out? How much wiggling/pulling is involved. They are not coming out haha...unless I am missing something. Where'd you get your manual? I have the Haynes one and I do not even have a 6-60. Last edited by mckain87; 12-10-2013 at 06:13 PM. It will take a strong back and forth (front to back of the bike). They're like a suction, so it will take some elbow grease to get them out. Okay, that's no problem just want to make sure. I do not always like pulling too hard on things I have not messed with before! So another quick bump! I need a reminder here! On the throttle bodies when they are removed there are two fuel lines with connectors on the fuel rail. I know one goes to the upper fuel rail that is removed when the airbox is removed and the other one goes to the bottom of the fuel tank. 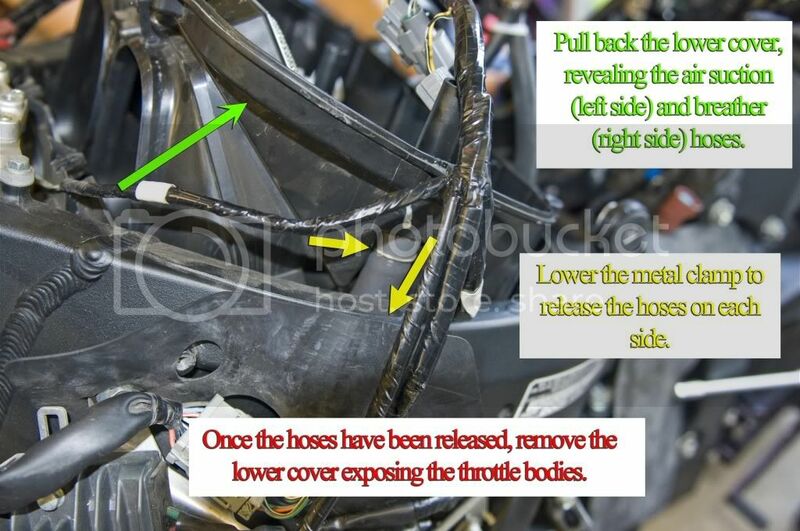 The lower hose is the one that connects to the fuel tank...correct? and the other hose connects to the upper fuel rain on the airbox? EXCELLENT post, you a life saver!! Solved my issue with replacing throttle tube. I couldn't get enough slack then found out i had to get more slack form the throttle cable end that's on the throttle body. I had no clue what to do but you took excellent pic's with even better step by step instructions. I may have not used all of the information you provided yet what i needed was completely resolved with your help. THANK YOU!! im assuming/hoping its quite the same procedure for an 03/04 model? Can anyone tell me what this hose is?